Jesse Handler ’09 was always a controlled, tough athlete—always seeking the next level. So when it came to senior year and his time playing competitive lacrosse—which he had done from an early age—was coming to an end, he looked for the next step. Mixed martial arts is not for the shy. Done inside a cage, the sport consists of fighting and wrestling, drawing from a mixture of martial arts disciplines. It ends when someone surrenders. Maybe not unlike men’s lacrosse, which to the uninitiated could look more like jousting—wielding sticks often at a body, and then flinging speeding balls at a net. So Handler found a place in Cherry Hill, N.J., and started learning the moves during fall and winter of his senior year. He had two fights, winning one and losing one, before going back to his last season of Swarthmore lacrosse, where he was known for his diligence. 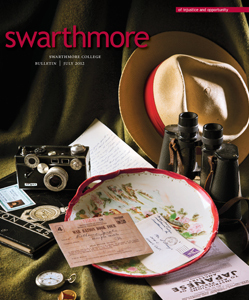 “He came up the old-fashioned way,” says Swarthmore lacrosse coach Pat Gress. “Jesse was deep on the bench his first two years, then moved up and played part time his junior year, then started his senior year. He was determined. And he practiced just as hard as a senior as he did as a freshman. “He is that epitome of an athlete,” says Gress. He was also the epitome of a diverse Swarthmore student, going straight into an M.D./Ph.D. program at New York University, with the Ph.D. component in molecular oncology and immunology, primarily researching potential pancreatic cancer cures. “It is one of the more difficult cancers, so I really wanted to study it. There is a long way to go, so it is a challenge, one that if we succeed, there is a real upside,” says Handler. Meanwhile, there were new athletic challenges to conquer. He looked around for mixed martial arts gyms near the downtown NYU campus and found a place in Chinatown where the fighting was a more controlled array of Asian martial arts. Handler chose Muay Thai, referred to as the “art of eight limbs.” An offshoot of kickboxing, competitors use eight points of the body—fists, feet, elbows and knees—to strike the opponent. It is fought like conventional boxing matches—either there is a knockout or judges reach a decision at the end. In his two years of medical school, Handler had nine Muay Thai bouts, from the Bronx to north Jersey and even on Long Island. So far, Handler hasn’t been too beaten up—a few bruises, a concussion and some cuts. Not bad for three years of fighting. Yet he is eschewing fighting for a while, at least until his research schedule allows him more time to find bouts. Still, he isn’t letting his desire to continue in a different sporting vein lag. “I’m doing triathlons now. Have to keep up with something new,” he says. NYU even has a triathlon club, with coaching, and Handler did his first mini-triathlon in the fall. The next one will include 1,500 meters of swimming, 40k of biking, and 10k of running.